I have the quilt tops finished for 2 more baby quilts. YAY! The end is in sight, and I have since realized that the 6th of the 6 baby quilts I had to do was one for my own baby (which we just found out is a girl), so there's no rush on it. I'm feeling a little lukewarm about this first one, a scrappy rail fence...but I always like scrappy quilts better once they are finished, and I do love these fabrics--i'm a big american jane fan. this 2nd pic is a teaser, I don't want the recipient to see too much of it, I'm really liking this one. Hope to have them quilted this week! oh my goodness your fabric choices are fantastic! The lucky recipient is going to love it. Wonderful news about your little girl-to-be. The baby quilts are looking wonderful. I wonder what you'll make for your own baby? Congratulations on the little girl! I have to agree with the first poster, you have such an eye for colour combinations! I have to admit I have "stolen" lots of inspiration from you for my quilts! i LOVE the scrappy rail quilt. i've had something like that in my head for awhile now. i only hope mine turns out half as cute as yours does. 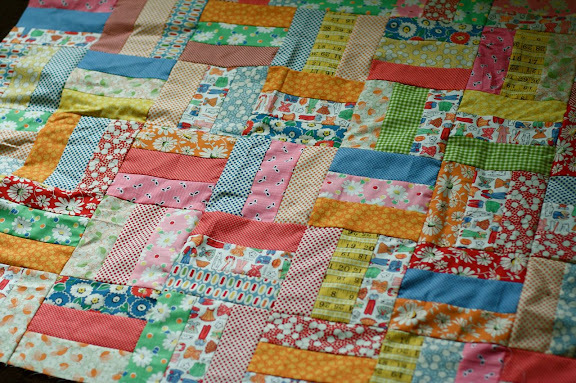 i agree, scrappy quilts look best in the end. hi! i love checking in on your blog from time to time-- it is so inspirational! you do amazing work, and i am always always excited to see what you've come up with! Congratulations! Baby girls are wonderful! 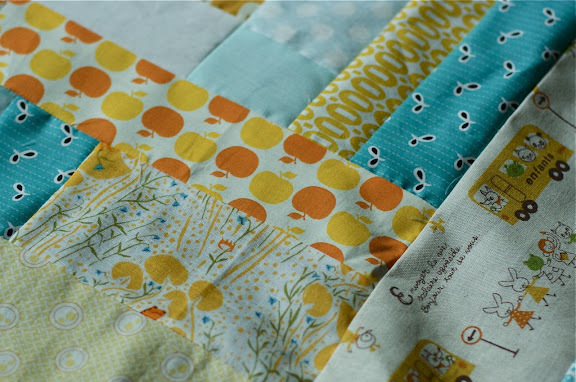 Love the scrappy quilt you have made! I am sure it will even more fabulous when quilted. You're right, American Jane fabrics are great. I love the scrappy quilt and I think once quilted it willlook amazing...the teaser...oh can't wait to see this one!! these are both really lovely. i think the combination of fabrics in the second one is particularly gorgeous. Seriously, I love American Jane too! congratulations on a little girl! 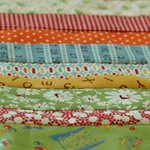 Love the fabrics you have for both quilts. Congrats with the little baby girl, I'm sure she will have a very nice quilt to be cuddled in. Congratulations on a baby girl. You have been very busy. I love the colours and fabric on the second quilt especially, I can't wait to see the finished top. I'm making a scrappy leader and ender rail fence quilt. Just using up whatever scraps I have available. I hope it turns out as nice as yours. Congrats on the baby girl! The first quilt is lovely and the second looks very enticing! Boy, do I love your blog with all of your beautiful work! Thank you for sharing and inspiring! Congrats on the baby girl news! These are darling! And you're having a girl. . . congratulations! love the baby quilts, and can't wait to see more of the second one!! congrats on your baby girl to be!! They are both adorable and I especially love the first one. Congrats on your little gem and being a winner at Acorn Moon....lucky stars. Great quilt. The fabric is so cute. What a darling quilt. I love them both, congrats on the new girl! I see that Far Far Away peeking out there! Your baby quilts are all wonderful...you have inspired me!!! LOVE the american jane rails! I'm always a little worried about scrappy quilts as I'm piecing them. They do always look a little better after they're finished. Congratulations on winning my blog giveaway! I hope by now you have been informed by email. i love them. scrappy is best imo. Can't wait to see the secret project in it's entirety! Great colors on both!! they are both to die for! so colorful. so good to see you are feeling up to sewing a lot! that first three months is always rough. yay for a new little girl! i can not wait to see her quilt. Congratulations! Now comes the hard part of actually picking a quilt to make for your own. Just luke on quilt nr. one?? I am really in love with it! Hi, I love your blog, I have a blog on tb craft in general and now I'm offering my readers to download the magazine found the net, http://agulhaetricot.blogspot.com, visit me, and also appears in my online shop Maison Carré by Tita, http://maisontitacarre.blogspot.com, kiss. Congratulations and best wishes for your baby girl!